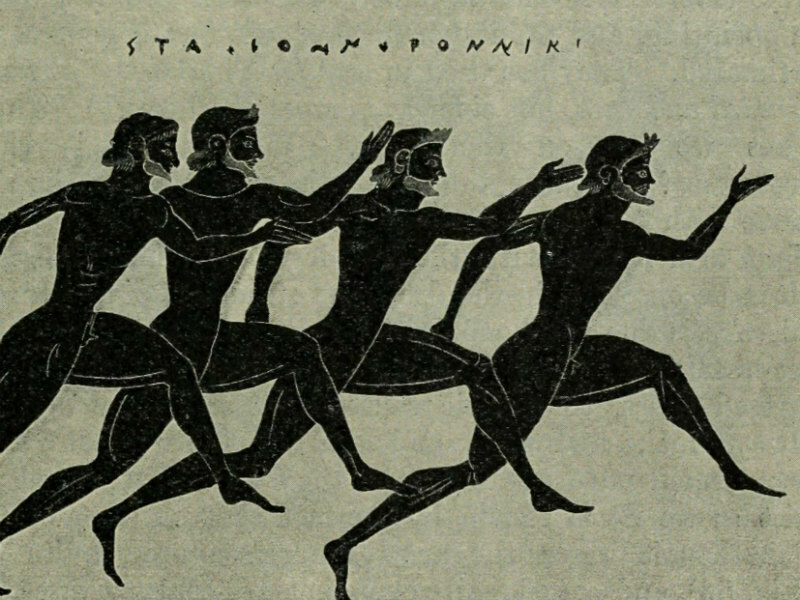 Athletic competition and physical activity have been a way of life for ancient Greeks since prehistoric times. The first athletic events in Minoan Crete are linked to religious ceremonies. In Mycenaean Greece, athletic games were an integral part of the ceremonies to honor in honor of eminent dead. The ancient Olympic Games were originally a festival, or celebration of and for Zeus. Later, events such as a footrace, a javelin contest, and wrestling matches were added. The Olympic Games were a series of athletic competitions among representatives of city-states and one of the Panhellenic Games of ancient Greece. They were held in honor of Zeus, and the Greeks gave them a mythological origin. They were held in ancient Olympia every four years from 776 BC, and were organized until 393 AD. when the Roman emperor Theodosius I abolished them definitively. This ended a one-thousand-year period in which the Olympics were held every four years. During the celebration of the games, an Olympic Truce was enacted so that athletes could travel from their cities to the games in safety. The Olympians also had religious significance since they were in honor of god Zeus, whose huge statue stood in Olympia. The number of competitions was twenty and the celebration took place over several days. The winners of the games were admired and became immortal through poems and statues. The prize for the winners was a wreath of olive branch. The observation of the races was allowed to all, free and slaves, even barbarians. It was strictly forbidden to women. For anyone who dared to violate this order, there was the death penalty. Since the 37th Olympiad (632 BC) teenagers have begun to take part. In the 103rd race (368 BC), Messinia’s Damascus wins the race at the age of only twelve. The Olympians also had religious significance since they were in honor of god Zeus, whose huge statue stood in Olympia. The number of competitions was twenty and the celebration took place over several days. The winners of the games were admired and became immortal through poems and statues. The prize for the winners was a wreath of olive branch. Panhellenic Games were one of the institutions of antiquity that gave Greeks the opportunity to remember their common features (language, religion, origin) and forget about what they were doing. Greeks, not only from mainland Greece but also from the coasts of Pontus(Black sea), the cities of Asia Minor, the colonies of Lower Italy and North Africa, came to attend or take part in these struggles. The winners, apart from the symbolic wreath, enjoyed prizes, privileges and, above all, respect for their fellow citizens. The races that emerged in Panhellenic were: Olympia, Pythia, Isthmia, and Nemea. Olympia, which was “the best place in Greece”, were the most important games of Hellenism, and they were overshadowed by all their other glamorous events. The simple street race, the “stadium” was the first race to be established. Until the 15th Olympic Games, the athletes who took part wore a small apron, and later they were struggling naked, demonstrating their performance in warfare. Diaulos was a double-stadion race, c. 400 metres, introduced in the 14th Olympiad of the ancient Olympic Games (724 BC). Dolichos in the ancient Olympic Games was a long-race (ca. 4800 m) introduced in 720 BC. The average length of the race was approximately 18-24 laps, or about three miles. The Ancient Olympic pentathlon was an athletic contest at the Ancient Olympic Games, and other Panhellenic Games of Ancient Greece. Five events were contested over one day, starting with the stadion (a short foot race) followed by the Javelin throw, Discus throw, Long jump, and ending with wrestling. Ancient Greek boxing dates back to at least the 8th century BCE (Homer’s Iliad), and was practiced in a variety of social contexts in different Greek city-states. Boxing was a violent and often deadly event. The hands were reinforced with thick leather straps from the elbow to the punches, while the fingers were left uncovered to close, forming a punch. Wrestling was a very popular sport. According to myth, Theseus was the one who discovered the technique of struggle, so that the winner is not dependent only on his physical strength, but on the technique, the flexibility and the gesture of his movements. The chariot race was conducted at a special stage, the “racetrack”, of unknown dimensions today. The chariot racing event was first added to the Olympics in 680 BC. The races were held in the hippodrome, which held both chariot races and riding races. The hardest sport in the Olympic Games was unquestionably pankration. It was a combination of wrestling and boxing. introduced into the Greek Olympic Games in 648 BC and was an empty-hand submission sport with scarcely any rules.